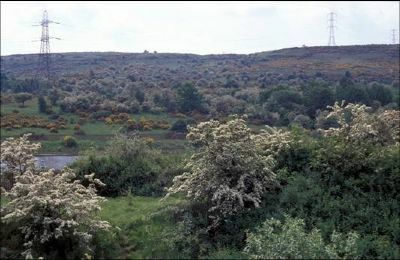 Brownside Braes lies on the eastern part of the Glennifer Braes Country Park and is located between Paisley and Barrhead on the B774 Caplethill Rd. Access to this site by car is very easy with good parking at Brownside Farm (NS 488 607). Bus services from Paisley and Barrhead are regular and both bus stops are located at the farm entrance. A new cycle path also runs nearby. The main pathway to Brownside Braes is well signposted and leads south past the farm and gently meanders uphill to the 150 metre contour line. Spectacular views over Paisley and Glasgow to the rugged northern horizon are well worth the effort. Brownside Braes is a mixture of pastoral farmland with distinct tracts of dense hawthorn scrub which attract a wide variety of bird species. 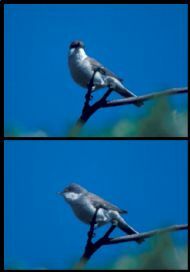 Over 85 bird species have been recorded within a 1km², of which an amazing 60+ have also bred. Most birdwatchers will know that this is the best place in Renfrewshire to see the rare Lesser Whitethroat. In the past twenty years there have been 2-3 territories and after a recent absence of six years where no breeding birds were located, a pair was seen feeding young in 2009. Spring is the best time to visit Brownside Braes, as most of the songbirds are holding territory. Other common warbler species also breed here in good numbers with Willow Warblers peaking at around 35+ pairs and 6-8 pairs of Common Whitethroat. Sadly, this place no longer holds any breeding Yellowhammers. Brownside Braes was a well known county stronghold for this species, for up to 12 pairs regularly bred here. During the winter months, Fieldfares and Redwings gorge themselves on the berry laden hawthorn crop. Look out for Short-eared Owl quartering the upland grazing and Woodcock too are occasionally seen. The Cross Stobs Inn is within walking distance and is a popular local pub serving good food and real ale. Located on the junction of Grahamston Road and Caplethill Rd.